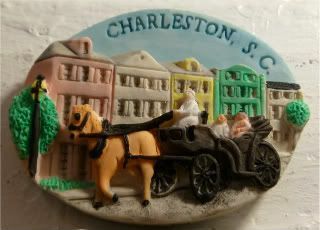 I've been to Charleston several times over the years, but it was actually STW BIL got this magnet for me on his travels. That's a buggy ride down Rainbow Row, a colorful set of row houses that were originally built in the 1700s as a commercial district, and were restored in the 1920s and 30s in Colonial Caribbean colors. When I was little, we did one of those touristy carriage rides throughout the streets of Charleston - the multiple-passenger ones with a team of horses out front. Pretty cool when you're 10! It was our own surrey with the fringe on top! Lately, I kinda feel like I'm driving a horse & buggy down here below the Mason-Dixon line. Having been in NY for almost half my life, I've gotten used to a fair amount of hustle and bustle. Moving quickly about my day, fast service wherever I go, subways to get to my destination quickly, not stopping for anything but those tourists in the middle of the sidewalks. Down here, it takes 10 minutes just to get to town from my house, and up and down the country roads I go. And more than half that time, I get stuck behind someone who is taking a country drive (literally), someone who must know full well that the speed limit is 55, but takes it 45 or 50 anyway. This morning, taking Mom to work? Seriously, a line of cars behind one guy just moseying down the road. Dudes. He was backing up traffic (yes, traffic) at 5:45AM (yes, 5:45AM). Move it along, buster! Oh, and don't get me started on the chit-chat. In the CVS line. And the post-office line. Basically, checking out anywhere. Even when there's a line of 5 people behind me, it's folks finding out how other folks (and their family and their extended family) are doing. Hey lady, ring 'em up and move 'em out! But I can't really complain too much about people catching up with each other, when really, it's just good old folks caring about their neighbors. And I admit, it really is kinda sweet when even the guys at the local dump are asking me how my dad is doing. I will say that the slow lane is starting to rub off on me, though. Yesterday, my dad chided me for "dilly-dallying at the stoplight." Ah, backseat driving. Well, at least we know he's feeling a little bit better, ya'll. I'm pretty sure I'd go crazy. Serious crazy.